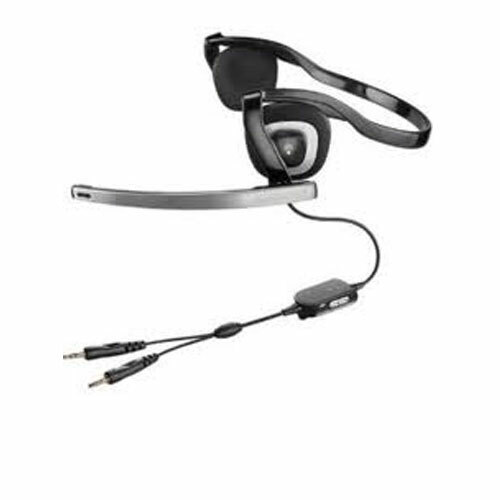 Plantronics .Audio 325 Computer Headset - Headsets Direct, Inc.
.Audio 325 Computer Headset has been discontinued. Bass-thumping stereo never looked so chic. Explore music, gaming, DVDs, and voice applications in robust stereo sound with our hottest new design. The Plantronics .Audio? 345 Behind-the-Head Enhanced Multimedia headset features a sleek, pressure less headband that rests stylishly above the neckline for a feather-light fit. Soft, swivel-mounted ear cushions deliver acoustic precision and ensure all-day comfort. A noise-canceling microphone enhances speech recognition, while the QuickAdjust? telescoping, pivoting boom assures ideal microphone placement. Convenient inline volume and mute give you full control over your listening and speaking experience. The .Audio 345 is compatible with popular PC sound cards for plug-and-play ease.